This is not a recipe for "Khada" pav bhaji in which you can feel individual pieces of potatoes, onions and other veggies.. this one is the smooth textured, mashed Pav Bhaji and the only thing that stands out is the green peas. Boiled mixed veggies blended into a puree - manual mashing won't give the same smooth texture.. and this is a good way of including carrots, beans and other nutritious veggies in the meal. Beet Root water for natural color - It looks fantastic!! very close to the thela wala color. Whenever you boil a beet root save the red colored water. It lasts for a couple of months in the fridge. 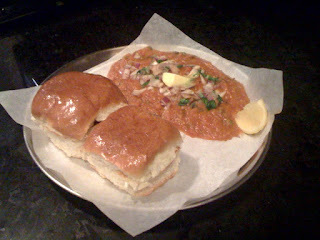 If you can - get Pav Bhaji Pav from an Indian bakery - NO - burger buns are NOT a substitute for Pav! 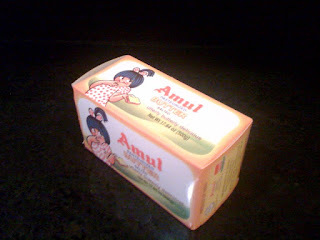 Heat one inch cube of Amul butter in a pan. Once butter is melted add finely cut onions to the pan and shallow fry for about a minute on medium heat. Turn the heat to low-medium and cover the pan for about half a minute. The onion should be sweating by now..
Add pureed mixed veggies and fresh tomato puree and mix well with the onions. Turn the heat up to medium. Add 1/2 inch cube of Amul butter and mix well till the butter is melted completely. Add 1 tsp Pav Bhaji Masala, 1/2 tsp red chili powder, a little bit of salt and mix well. Cover the pan for about a minute and a half. Add mashed potatoes to the pan and mix well with the rest of the ingredients. Add 1 inch cube of Amul butter and mix well till the butter is melted. Add 1/2 tsp Pav Bhaji Masala, a pinch of chili powder and salt. Mix well. Taste the mixture and adjust spice level as per your taste. Add defrosted green peas, chopped coriander leaves and mix well. Cover the lid for about a minute so that peas are half cooked. Now add last (optional) 1/2 inch cube of Amul Butter and mix well till it melts. Add beet root juice/water and mix well till the color is uniform throughout the bhaji. cover the lid and let it cook for 3-4 minutes. For garnishing, mix chopped onions, cotriander leaves, salt, chili powder and lemon juice. Cut all the Pavs into two halves. Heat a pan for toasting Pav. Melt a little butter on the pan and heat a pair of pav with the white side on the pan. Once the white side is crispy and golden, tunr the Pav and heat a little bit on the brown side. Serve hot with the garnish, extra butter and a side of Masala Papad..
Nice. For more authentic road-side pav bhaji, add the phrase "and butter" at least one more time to each paragraph. e.g. "add beet root juice/water and butter", "serve with garnish, extra butter, masala papad and butter", "Add mashed potatos and butter", etc. hahahaha :-) very true - I did not write it that way intentionally..
BTW, the amul butter in pav bhaji is synonymous with the amul butter in an alu paratha at a punjabi dhaaba or in a masala dosa at a south indian SLV...lots of yummy butter!! But you should go to either ShivSagar on GM road or Jayashree's gardens. Both have excellent Pav Bhaji! Ok have to chime in ....Sardar pav bhaji, Tardeo, Mumbai ...Tooooo gooood !! Anonymous - Is the Tardeo Pav bhaji supposedly the place where Pav Bhaji was invented?